I Greek temples they were built in a raised position, in the upper part of town called Acropolis. The temple was the symbol of the earthly abode of the gods, where the faithful could could attend the sacred areas. Unlike the Mesopotamian and Egyptian temples those Greeks have a relatively simple architecture ’ and express an ideal of perfection and harmony. 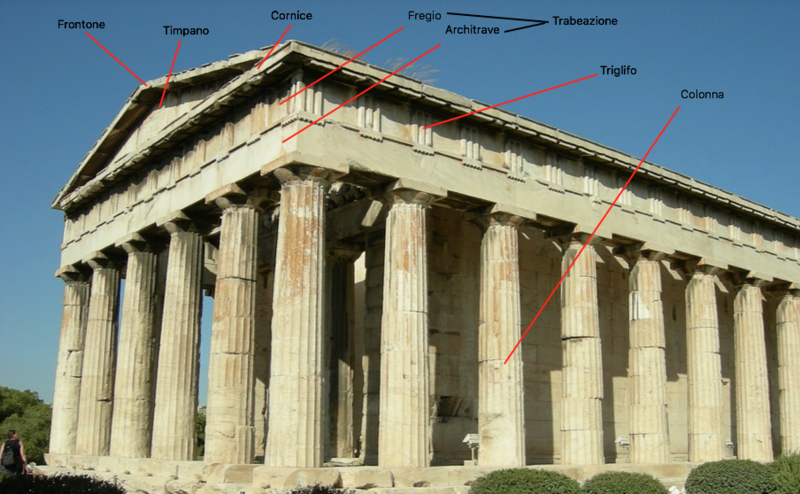 L ’ Greek temple architecture It is based on precise measurement units and constituents in certain proportions among themselves. The various parts of the temple fit perfectly into the landscape, allowing nature to be glimpsed and natural light to pass through columns. L ’ temple architecture is based on the architrave, where a sequence of columns supporting an architrave, horizontal element bearings. At the center of the temple we find the cell or NAOs with rectangular plan where was the statue of the deity to whom the temple was dedicated. This ’ area was reserved for priests, While religious ceremonies to which citizens could participate in outer space were held near the main façade. The portico of access formed by a row of columns in front of the cell was instead the portico. The temples were usually decorated with sculptures and brightly colored. The most used colors were blue, Red and white with some parts in gold. In this way, the sculptures of the pediments and friezes emphasized with greater decision while avoiding the glare of the Sun. As you can see from the image ’ the top of the temple is triangular. Between the two sides short form the gable and gable, where were placed the sculptures. Above the columns is the entablature, composed in turn from ’ lintel, from frieze and cornice.